Scroll down to see the top not-for-profit colleges offering public administration degrees online. Anne Maria College offers a Master of Public Administration online with five different specializations: General Track, Criminal Justice, Emergency Management, Fire and Emergency Services, and Homeland Security. These specializations offer students the necessary information to prepare for a variety of positions including human resources manager, emergency management specialist, fire chief, city planning & management, nonprofit management, emergency management operations, financial management, economic development, chief of police or detective, public works director, emergency services director, or chief development officer. There is also a mid-career track, which allows students to waive up to two courses if they have at least four years of work experience in public administration or one of the specialization areas. Arkansas State University offers a Master of Public Administration online. The program can be completed in as little as 18 months, and it consists of 36 credit hours. The program includes courses that center around the skills that are necessary to manage people, resources, and programs effectively. The program is fully accredited by the National Association of Schools of Public Policy, Affairs, and Administrations (NASPAA). Students enrolled in the program will take courses such as Administrative Behavior, Public Policy Analysis and Evaluation, Administrative Leadership, and Public Information Management. Barry University offers a Bachelor of Public Administration (BPA) and a Master of Public Administration (MPA). The bachelor's degree is an undergraduate degree that is most accepted for professional employment in general public administration. For many professions such as fire, police, and planning, the degree is highly desirable. The Master's degree program is geared towards adult learners who want to focus on professional development within public, not-for-profit, and other organizations that serve a public purpose. Barry University applies the Judeo-Christian ethical framework to the field of public policy, and the online degree programs are ideal for adult learners, including active-duty military. Students in the public administration program take courses such as Values and Ethics in Public Administration and Non-Profit Administration. Belhaven University offers an online Master of Public Administration and an online Master of Public Administration - Human Resources Concentration. The program prepares graduates for management responsibilities and leadership roles. The online program is designed for the working adult, and it consists of manageable eight-week sessions. The human resources concentration allows students the chance to focus on the study and the application of human resource principles in areas such as compensation and benefits and employee relations. Students enrolled in the program may take such courses as Advanced Organizational Behavior, The Legal Environment of Business, Managerial Economics, and Principles of Executive Leadership. Bellevue University offers a Master of Public Administration degree entirely online. The program offers a foundational and professional education for those who wish to serve the public in leadership roles in nonprofit organizations or the government. Graduates of this program will be prepared to hold senior level roles which necessitate a comprehensive understanding of public organizational issues, align policy with budgets and funding sources to complete a funding project, communicate effectively in written and oral communications, and evaluate the potential effectiveness of theories and models that are relevant to public organizations. Students in the M.P.A. program will take courses such as Human Resources and Organizational Effectiveness as well as Finance for the Public Administrator. California Baptist University offers a Bachelor of Arts in Public Administration, a Master of Public Administration, and a Doctor of Public Administration entirely online. All degree programs in public administration will provide students who wish to serve the public with professional development. Students pursuing a public administration degree at CBU will gain the knowledge and the skills to address issues in a global context through the lens of a Christian heritage. CBU Online is well respected, and the school has received many awards and recognitions, including ranking in the top 40 best online bachelor's degrees by U.S. News & World Report for four years in a row. Students in the online Master of Public Administration program offered by California State University Dominguez Hills can choose from several concentrations: criminal justice policy and administration, health care policy and administration, nonprofit management, and public management. Classes for the first three options are delivered in eight-week terms, with six terms per year. The public management concentration is delivered in four 12-week sessions per year. Recently accepted students for this program have an average undergrad GPA of about 3.0 and are largely graduates of colleges and universities in California. Many MPA graduates find jobs in local government at the city or county level, with others working for a state or national government agency or nonprofit. The Tseng College of Graduate, International and Midcareer Education at California State University Northridge has an online Master of Public Administration program that offers three concentrations: public sector management and leadership, nonprofit sector management, or health administration. All three options are two-year programs that use a cohort format. Applicants should have a bachelor's degree with a 3.0 GPA and at least two years of work experience. Northridge also has an online Bachelor of Arts in Public Sector Management that is a degree-completion program for working adults. Students can earn the B.A. in about 2.5 years. The university is the largest provider of MPA degrees in California and the third largest in the U.S. The Global Campus of Central Michigan University offers a Master of Public Administration online. This degree is ideal for students who wish to pursue leadership positions within the public and private sectors, and the program will provide students with increased skills in legal and constitutional frameworks, policy analysis, collaboration, and ethical decision solving. The M.P.A. at CMU is accredited by the Network of Schools for Public Policy, Affairs, and Administration (NASPAA), and it focuses on the areas of fiscal management, organizational governance, best practices, strategic planning, and research methods. Students in this program will take such courses as Public Service Competencies, Strategic Leadership, Foundations of Public Administration, and Public Policy Processes and Evaluation. All 14 of Colorado State University's online baccalaureates allow for a specialization in Public and Non-Profit Management. They degrees are quite varied, ranging from a BS in Communication to a BS in Information Technology. The specialization requires completing just five upper-level courses, which span topics such as finance, strategy, grant writing and community development. Those looking for a resume boost can enroll in just those five courses and walk away with a non-degree certificate of completion. U.S. News & World Report, however, would likely recommend completing the full four years - it ranked the Global Campus's bachelor's degrees among the top 25 in the country in 2018. The School of Public Service at DePaul University offers a Master of Public Administration online, and it is available in three specializations: Public Management, International Public Management, and Metropolitan Planning and Urban Affairs. The goal of this program is to ethically educate future leaders and employers of local, state, and federal government. In this program, students will learn to alleviate poverty, build responsive government, and connect global and domestic issues. The degree includes an experiential component and requires students to have a professional experience within a government setting. The program takes at least two years to complete though many students finish in three or four years. Students will take such courses as Cross-Sector Analysis and Policy Design and Analysis. Eastern Kentucky University offers a Master of Public Administration entirely online, and it is taught by the same highly qualified, experienced professors that teach the on-campus courses. Whether you are a seasoned professional or you are just beginning your career in public service, the M.P.A. will be a beneficial degree. The degree is available in a customizable general track as well as a community development track, and certificate options are available in emergency management, homeland security, fire and emergency services, and occupational safety. The program is accredited by the Network of Schools of Public Policy, Affairs, and Administration, and it is committed to the high standards set by the National Association of Schools of Public Affairs and Administration. Florida International University offers a Bachelor in Public Administration as well as a Master in Public Administration entirely online. These degrees prepare students for fulfilling and satisfying careers in nonprofit organizations or government. Additionally, the B.P.A. degree prepares students who wish to pursue the M.P.A. degree. Online students are provided with a personal success coach who will offer guidance and motivation throughout the program. Students pursuing a B.P.A. will take such courses as Public Sector Budgeting and Personnel Skills for Public Administrators. Additionally, the M.P.A. program is accredited by the National Association of Schools of Public Affairs, and it was ranked the #1 M.P.A. program in South Florida by U.S. News and World Report in 2012. Golden Gate University offers a Bachelor of Arts in Management with a Public Administration Concentration, a Bachelor of Science in Business with a Public Administration Concentration, a Master of Business Administration with a Public Administration Concentration, an Executive Master of Public Administration, and a certificate in Public Administration Leadership. The B.A. in management, and the B.S. in business, and the M.B.A. are all more general business degrees with a concentration in public administration. This allows students to gain more generalized business skills while also learning a great deal about public administration. The E.M.P.A. program is offered in an accelerated format in as little as 18 months. For students who wish to pursue an online degree, Indian River State College offers a Bachelor of Science in Public Administration - Public Policy and Leadership. This degree prepares students to effectively manage people as well as projects, ensure efficient use of resources, and provide high-quality service. The degree also will prepare students for graduate studies in public administration or for law school. Students in this degree program will take courses such as Organizational Behavior and Administration, Urban and Regional Planning, Public Relations for Public Managers, and Policy Development and Implementation. Indiana University Bloomington offers an online Master of Public Affairs, which combines the management aspects of a Master of Public Administration with the analytical and policy skills of a Master of Public Policy. This 48-credit program includes six core courses, six to ten advanced electives, and an experiential component that includes an internship or project. Students with prior professional experience may reduce the degree requirements by up to 12 credits. Students can focus on public management, nonprofit management, policy analysis, or public budgeting and financial management. Students who want to meet their classmates and instructors in person have the option of taking a one-week intensive on-campus course over the summer. IU Bloomington also offers several related graduate certificates through online coursework. Indiana University offers an online program leading to a Master of Public Affairs with no on-campus requirement. The program uses an interdisciplinary approach to prepare graduates for careers in public administration, nonprofit management or policy analysis. The program requires students to complete 48 credits, including an experiential component, which can be fulfilled by an internship, research project, or possibly through prior experience. Required core courses cover topics such as public management, statistical analysis, public finance, and law and public affairs. Students also take at least six electives to tailor the program to their career goals. Several related certificates are also available online, including certificates in public management, public budgeting and financial management, and nonprofit management. The Department of Political Science & Public Administration at Jackson State University offers a Master of Public Administration entirely online. The degree is offered in seven concentrations, but only five of the concentrations are available entirely online: Administrative Management, Criminal Justice, Education, Emergency Management, and Geographical Information Systems. The Master of Public Administration program is accredited by the Network of Schools of Public Policy, Affairs, and Administration (NASPAA). This program will prepare students for employment in leadership roles in the non-profit or public sector, and each concentration focuses on a different aspect of public administration. Marist College offers a Master of Public Administration entirely online. The program is geared towards those who wish to take on leadership positions in the public, private, or non-profit sector, and here are three different concentrations available: Ethical Leadership concentration, Healthcare Administration concentration, and Public Management concentration. The ethical leadership concentration focuses on making positive decisions in preparation to become effective and ethical leaders, the healthcare administration concentration centers around understanding the big picture about the healthcare industry, and the public management concentration focuses on effective and successful management of organizations. The program is accredited by the Network of Schools of Public Policy, Affairs, and Administration (NASPAA). Students who want a career in public administration can earn an undergraduate or graduate degree in online programs offered by National University. The university also has a B.P.A. to M.P.A. program that accelerates a master's degree for students who are currently in the bachelor's program. Undergraduates are required to take 12 core courses in the major and four upper-division electives in related subjects. The program ends with a senior research project in public administration. The master's program allows students to choose a specialization in human resource management or organizational leadership. Earning the master's requires students to complete 12 courses, including eight core requirements, such as urban planning, financial management, and a master's project. For students seeking online degrees, the School of Professional Studies at Northwestern University offers a Master's in Public Policy & Administration entirely online. This program is unique because it includes both the administrative and the analytical sides of the discipline whereas most degrees in public policy only focus on one or the other. Four different specializations are available: a Public Administration Specialization, a Public Policy Specialization, a Global Policy Specialization, a Global Health Specialization, and a Health Services Policy Specialization. Many graduates of the program go on to become city administrators, regional planners, federal workers, health services managers, and emergency managers. Students in the program will take such courses as Public Finance and Budgeting and Fundamentals of Public Administration. Norwich University offers a Master of Public Administration online. The program is specifically geared towards students who wish to pursue careers in leadership roles in government or serving the public, and it helps them to acquire the skills and knowledge necessary to advance their careers. The M.P.A. program is available in eight concentrations: Criminal Justice and Public Safety, Fiscal Management, International Development and Influence, Municipal Governance, Nonprofit Management, Public Works and Sustainability, Policy Analysis and Analytics, and Public Administration Leadership and Crisis Management. The program can be completed online, but there is a final academic requirement that students come to the Norwich University campus for a week-long residency. The School of Public Service in the Strome College of Business at Old Dominion University offers a Master of Public Administration entirely online. The M.P.A. program is specifically meant for students who wish to pursue leadership roles within the public or non-profit sectors. The program focuses on five central areas of study: organizational design processes as well as behavior, policy evaluation and program analysis, both qualitative and quantitative analysis techniques, public management processes, and political and ethical concepts of public administration. The M.P.A. program at ODU is accredited by the Network of Schools of Public Policy, Affairs, and Administration. Students will take a combination of core concentration classes and electives. The Hauptmann School of Public Affairs at Park University offers a Bachelor of Public Administration online with five different concentrations: Public Service, Business Relations, Criminal Justice, Homeland Security, and Fire Service Management. The program is specifically geared towards students who wish to pursue entry-level positions, continued professional development, and graduate studies. Students Public Management and Leadership, American National Government, Public Service Values, and Capitalism and Societal Issues. B.P.A. students who wish to pursue an M.P.A. may be able to gain early access to courses in the M.P.A. program if they have a 3.6 GPA or higher as well as the approval of the Dean of the Hauptmann School of Public Affairs and the Director of the M.P.A. Program. Rutgers University has a Master of Public Administration that is offered in a 100 percent online format. Students can complete the degree in as few as two years, and full-time and part-time students are accepted. The curriculum calls for 11 courses, for a total of 33 credits. Students select three courses from a concentration area: budgeting and financial management, nonprofit management, public and nonprofit performance management, or healthcare administration. All students complete a capstone project to analyze a real-world problem under the guidance of a faculty member. Rutgers's graduate public management/administration program was ranked No. 13 in 2017 by U.S. News & World Report. San Diego State University has an online Master of Public Administration that students complete in 16 months. This cohort-based program is for experienced professionals such as those working for government or nonprofit agencies. The 36-credit program is taught in six modules that each run for two months. Each module includes two courses, which are delivered asynchronously. Students must come to campus twice, once at the start of the program and again at the end of the program. The program finishes with a capstone applied research project. Applicants can have a bachelor's degree in any field with a GPA of at least 2.85. GRE scores are required. Students without professional experience might have to take an internship course. The Department of Public Administration at Southern University and Agricultural and Mechanical College Online offers an Executive Master of Public Administration degree. The department is accredited by the National Association of Schools of Public Affairs and Administration, and it is specifically geared towards individuals who already have public sector work experience. To enroll in the program, students must have at least three years of work experience in a managerial, supervisory, or upper level context. At least two of those years of experience need to be with nonprofit organizations or government institutions. The Department of Political Science & Criminal Justice of Southern Utah University offers a Master of Public Administration degree online. The program is accredited by the Network of Schools of Public Policy, Affairs, and Administration. The program is 36 hours, and it's geared towards students who are interested in pursuing management positions within the non-profit or public sectors. Classes in the program will focus on analysis of important aspects of public service, the development of the ability to reason critically, and forming coherent ideas and positions on key policy and public administration issues. Students enrolled in the program may take such courses as Public Sector Economics, Research Methods for Public Administration, and Critical Thinking and Ethics in the Public Sector. Students can enter the online Executive Master of Public Service and Administration program at Texas A&M University in the fall, spring, or summer semester. Courses are all online, but students are required to complete a one-week residency held in July each year, or a total of two over the course of the program. Three specialized tracks are available: homeland security, nonprofit management, or public management. Candidates complete a culminating capstone project with partners from industry or government. This is a 39-credit program, with fall and spring classes running for 15 weeks and summer classes running for 10 weeks. Applicants must have at least five years of professional experience, preferably in one of the specialty track areas. Texas Southern University offers an Online Executive Master in Public Administration program, which focuses on public policy. Graduates of the eMPA program will have a new array of professional, conceptual, and quantitative skills as well as the ability to utilize information technology and also systems for effective communications and decision making. The online program provides students with more flexibility, affordability, and accessibility than a program on campus. Students in the eMPA program will take such courses as Public Administration Theories and Practices, Research Methods in Public Administration, Leadership and Decision Making, and Government Budgeting and Financial Management. The University of Texas - Arlington offers a Master of Public Administration program online. It is certified by the Network of Schools of Public Affairs and Administration (NASPAA), and it was rated in the top 75 M.P.A. programs in the nation by U.S. News & World Report. This program centers around management and leadership roles in public services at all levels of government, in non-profit organizations, and in businesses like consulting firms. Students will take courses such as Foundations of Urban Research and Analysis, Ethics in Public Service, and Financial Management in the Public and Non-Profit Sectors. Online students pursuing a Master of Public Administration from Troy University can choose from seven concentration areas: public management, government contracting, justice administration, public health administration, nonprofit management, public human resource management, and national security affairs. Students who desire can pursue two concentrations. Overall, the curriculum requires nine core courses and three courses in the concentration. Candidates who do not have at least one year of professional experience in nonprofit or public administration work may have to complete an internship. Applicants should have a bachelor's degree with at least a 2.5 GPA overall or 3.0 for the last 30 credits. GRE scores are required from all applicants. The University of Alaska Southeast School of Management offers a Master of Public Administration entirely online. The program is geared towards non-profit and public managers who are seeking to enhance their credentials and expand their potential within their field. The program is an Institutional Member of the National Association of Schools of Public Affairs and Administration. The M.P.A. program is available with a rural development concentration as well as a natural resource concentration, and students in the program will take such courses as Organizational Theory and Behavior, Law for Public Managers, and Human Resource Administration. One of the selling points of UCF's Master of Public Administration (MPA) is that it gives students not one, but two dual degree options - one with a Master of Nonprofit Management (MNM) and the other with an MS in Criminal Justice. The standard MPA, which is completely online, is 42 credits. It mandates nine courses that cover policy, finances, planning and management. Students choose four additional courses as electives before completing a capstone. The admissions committee is looking for applicants with a background in public service. The MPA/MS in Criminal Justice program inserts further requirements and adds a second capstone, taking it to 51 credits. The MPA/MNM takes a similar approach, landing at 54 credits. University of Colorado - Colorado Springs offers a Master of Public Administration entirely online. The degree prepares students for leadership roles within the nonprofit and the public sectors. The program is specifically designed for professional individuals who would like to pursue policy or administrative related careers in nonprofit organizations, the public sector, the criminal justice system, national security, and more. The program consists of 36 - 39 credit hours, and the online classes are taught by the same highly qualified faculty that teaches the classes on campus. Students enrolled in the program will take courses such as the Policy Process and Democracy, Nonprofits and Public Policy, and Collaboration Across Sectors. The 36-credit Master of Public Administration (MPA) at CU Denver is for neophytes and seasoned professionals alike. Regardless of prior experience, students must complete six core courses - ranging from Organization Management and Behavior to Ethics and Leadership - and can then pull from five electives to form a concentration in Nonprofit Management or Homeland Defense. The program ends with either a client-based capstone project or a thesis. Students who have never worked for a government agency or nonprofit must complete a three-credit internship to graduate. University of Hawai'i - West O'ahu offers a Bachelor of Arts in Public Administration online. This degree prepares students for leadership roles in the public sector. The B.A.P.A. offers concentrations in Health Care Administration, Justice Administration, Disaster Preparedness and Emergency Management, and General Public Administration. The General Public Administration track prepares students for careers in administration and management with all levels of government, and the other concentrations prepare students for careers in each respective field. Students in the B.A.P.A. program will take courses such as Principles of Public Administration, Public Communication Campaigns, and Administrative Decision. The University of Illinois - Springfield offers a Master of Public Administration degree online, and it is accredited by the Network of Schools of Public Policy, Affairs, and Administration. The online program offers the same high quality educational experience as the program on campus including the same highly experienced faculty. They also offer a nonprofit management certificate, a certificate in homeland security, and a joint Master of Public Administration/Master of Public Health degree. All of these are available entirely online as well. Students enrolled in the program may take such courses as Human Resource Management, Organization Dynamics, Analytical Tools, and Public Policy for Managers. The Department of Public and Health Administration in the College of Business and Public Management at University of La Verne offers a Bachelor of Science in Public Administration online. This degree program is both professional and academic in nature, and it prepares students for management positions within the non-profit or public sector. Students will take a combination of general education classes, core concentration classes, and electives, and the electives are offered in two areas: The Organizational and Management Context of Public Sector Administration and The Policy and Institutional Context of Public Administration. Core concentration classes include courses such as Urban Environments, Administrative Processes, and Management of Change and Conflict. The Harry S. Truman School of Public Affairs at the University of Missouri offers a Master of Public Affairs, which is a 33-hour degree program that is available entirely online. This program is geared towards public service professionals at all levels and from all backgrounds. The program will prepare students to be exceptional leaders in the private, public, and nonprofit sectors that will bring about positive change. The goal of the program is to give students a comprehensive understanding and knowledge in the areas of social entrepreneurship, public policy strategy, financial management, ethical leadership, organizational dynamics and leadership, collaborative governance, economic analysis, and research methods. The University of North Carolina at Chapel Hill offers an online program for students who want to earn a Master of Public Administration. The program, known as MPA@UNC, requires students to complete 45 credits. The program offers a choice of focus areas: community and economic development, international relations, public health, local government, and nonprofit management. Students take up to five electives in the focus area to gain a depth of knowledge about the subject. Candidates are also encouraged to gain experience through a professional work experience practicum, and some students may devise a project at their workplace that qualifies. Some students complete the program is as little as 18 months, although candidates may take up to five years. The Department of Political Science and Public Administration of University of North Carolina - Pembroke offers a Master of Public Administration, which trains students for leadership roles within the non-profit, public, and private sector. The program does not require students to have a particular background, and students with undergraduate degrees in other fields may still excel in the program. Students enrolled in the program can take such courses as Leadership and Administration in Public Affairs, Principles of Budget and Finance, Health Administration and Organization, and Sustainability and Hazard Resilience. Villanova University offers a Bachelor of Arts in Public Service and Administration as well as a Master of Public Administration, and both degrees are available entirely online. In these programs, students will gain knowledge in the areas of leadership ethics, public policy and budgeting, organizational effectiveness, strategic planning, and more. Graduates of the bachelor's degree program often work in the career fields of public administration, non-profit management, criminal justice, city planning, and more. The M.P.A. program is accredited by the Network of Schools of Public Policy, Affairs, and Administration (NASPAA), and many M.P.A. graduates have become successful leaders in both non-profit organizations and public service. The School of Behavioral and Social Sciences at Wayland Baptist University offers a Master of Public Administration, which is specifically designed to prepare both non-public and public employees for a successful career and/or promotion in the field of administration. The program has three specializations: justice administration, homeland security/emergency management, and government administration. The program is 36 hours, and it can be completed in 18 months. Students in the M.P.A. program take such courses as Legal Environment, Public Administration, and Research Methods. Do you work in the public sector or a non-profit organization? Are you looking for a distance learning degree that will prepare you for a career in management & public policy? Our guide to online public administration programs is here to help. You’ll find tips on choosing the right online degree, transferring credits, taking advantage of tuition breaks for military & veterans, and more. We also have handy summaries of the top online schools in our rankings for both quality and price. Unsure if public administration is the right field for you? 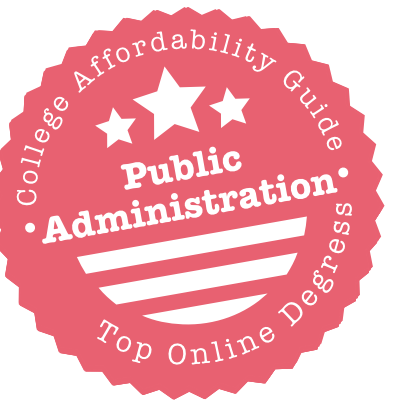 Check out our blueprint on Affordable Public Administration Degrees. We go into greater detail about degree options (e.g. BBA vs. BPA), coursework, specializations, and specific job prospects for each degree level. You may even find a few on-campus programs in your state that you can compare side-by-side with your online shortlist. Can You Find a Regionally Accredited Program? They’re almost non-existent. And watch out for unaccredited, for-profit online associate programs in public administration—they’re usually the first to appear in a Google search. Instead, try alternative degree titles such as an Online Associate of Business Administration (ABA) or an Online AA/AS in a subject such as government. These will have courses that relate to the field (e.g. communication, business, public policy, social sciences, etc.). You can also earn General Education credits to transfer to a degree completion program in public administration. Will Your Online Credits Transfer Easily to a Bachelor’s Program? If you do find a program with useful coursework, check the transfer policy carefully. You want to make sure that all your online academic credits will transfer smoothly into a bachelor’s degree. This is one of the reasons we insist on regional accreditation. Universities & colleges are highly unlikely to accept credits from an unaccredited school. Can You Choose a Concentration? Many schools now offer intriguing specializations and electives at the undergraduate level. For example, the University of Hawai’i – West O’ahu’s Online BAPA has concentrations in healthcare administration, justice administration, disaster preparedness & emergency management, and general public administration. Meanwhile, Park University offers an Online BPA with concentrations in public service, business relations, criminal justice, homeland security, and fire service management. If you have a specific career in mind, you can start focusing on it now. What About Other Degree Titles? The Online Bachelor of Public Administration (BPA) isn’t the only player in the field! There are lots of undergraduate programs in other subjects that might suit your goals. For instance, all 14 of Colorado State University’s online baccalaureates allow you to choose a specialization in public and non-profit management. Degrees range from an Online BS in Communication to an Online BS in Information Technology. Decide where you want to focus your interests. Have You Considered a Business Degree? Remember, too, that many Online BBAs and online management programs include relevant public administration electives. For example, Golden Gate University offers both an Online BA in Management with a Public Administration Concentration and an Online BS in Business with a Public Administration Concentration. Business-focused programs will give you a firm foundation in corporate skills and train you to tackle public administration challenges. Is it a Degree Completion Program? Our list is a blend of traditional four-year programs and two-year “degree completion” programs for students who have earned their associate degree credits elsewhere. Just to highlight one example: California State University-Northridge has an Online BA in Public Sector Management that takes around 2.5 years to complete. 60 transferable semester units of General Education courses are required to apply, but students with an Associate Degree for Transfer (AD-T) from a California community college are guaranteed a smooth transition process. Check the admissions requirements for all the details. Can You Apply Academic & Career Credits? As a working adult, you may already have lots of experience in the proverbial bank (e.g. military service, PLA, college coursework in high school, etc.). The good news is that schools often allow online undergraduates to apply previous academic & career credits toward a bachelor’s program. The more credits you can apply to your bachelor’s degree, the lower your overall cost will be. Take advantage of every transfer opportunity. Does It Prepare You for Graduate Work? A BPA is only going to get you so far in the job market. Many public administrators end up pursuing an MPA; other students use their bachelor’s degree as a foundation for law school. Keep an eye on online undergraduate programs that will help you achieve these goals. For instance, National University has a BPA /MPA transition program that speeds up the process of earning an master’s degree. You may be able to save serious money on tuition along the way. What Can You Do With a Master’s in Public Administration? Think of it as the public sector’s equivalent of the MBA. An online or on-campus MPA will set you up for leadership positions (e.g. managers, executives, and policy analysts) in public and non-profit organizations, as well as NGOs. The curriculum for an MPA typically includes courses in executive skills and governance, accounting, finance, policy analysis, etc. What Do You Want to Specialize in? Choose a concentration, any concentration! Our rankings are stacked with online master’s programs in public administration that offer unique specializations. We’re talking about homeland security, healthcare administration, rural development, public management, metropolitan planning & affairs, emergency management, non-profit management, government administration, criminal justice—if you can name it, a university will have it. Do You Favor Public Administration or Public Policy? Graduate degrees in public administration tend to focus on leadership training and administrative challenges (i.e. management). Graduate degrees in public policy often include courses such as statistics, policy analysis, data management, and financial modeling—all the tools you need to make smart policy decisions. Some schools combine the two fields. Examples of this phenomenon include Indiana University Bloomington’s Online Master of Public Affairs and Northwestern University’s Online MA in Public Policy & Administration. What is an Online Executive Degree? Executive programs are built for seasoned public sector professionals who want to complete their degree in an accelerated (i.e. shorter) format. For instance, students applying to Texas A&M University’s Online Executive MPSA must have at least five years of professional experience. And at Southern University and Agricultural and Mechanical College, applicants to the Online Executive MPA must have at least three years of work experience in a managerial, supervisory, or upper level context; at least two of those years need to be with a non-profit organization or government institution. Alternatively, you might also wish to consider an Online Executive MBA with a public administration concentration. How About an Online Dual Degree? You don’t have to limit your search to an MPA or an MBA—dual degrees are also up for grabs! For instance, the University of Central Florida has paired its Online MPA with a Master of Nonprofit Management (MPA/MNM) and an MS in Criminal Justice (MPA/MSCJ). You could be looking at coursework that exactly matches your requirements. Will You Be Part of a Cohort? Since the MPA is a leadership degree, full of networking and collaboration opportunities, universities often like to group their online students in a cohort. This means you go through the program with a group of people, all taking the same online classes at the same time. Examples of cohort-based programs include California State University-Northridge’s Online MPA and San Diego State University’s Online MPA for experienced professionals. Students in the San Diego program travel to campus twice to meet their fellow learners. Is There a Capstone Project or Practicum? In most cases, the answer will be yes. For instance, the Online MPA at the University of North Carolina at Chapel Hill encourages students to tackle a professional work experience practicum (e.g. a project at their workplace). At Indiana University, the Online Master of Public Affairs has a mandatory experiential component, which can be fulfilled by an internship, research project, or prior experience. We think these elements are great, especially if they have direct applications to your current job. Do You Need to Complete an Internship? Heads-up—you may be required to complete an internship if you lack professional experience. MPA programs are often reluctant to accept candidates who haven’t spent any time in the workplace. Examples of schools with an internship requirement include IU Bloomington’s Online Master of Public Affairs, San Diego State University’s Online MPA, CU Denver’s Online MPA, and Troy University’s Online MPA. You can usually waive the requirement if you have at least one year of prior professional experience (e.g. in a non-profit organization or the public sector). Does it Include a Campus Residency? The MPA has a similar structure to the MBA, so schools love to include opportunities for public sector leaders to connect with one another. For instance, at IU Bloomington, students in the Online Master of Public Affairs have the option of taking a one-week, on-campus course over the summer. At Texas A&M University and Norwich University, week-long residencies are required in order to graduate. Residencies open lots of networking doors, but you will need to budget for travel and accommodation. Is There a GRE or Work Experience Requirement? This will depend on the school. GRE scores are mandatory in some cases (e.g. Troy University and San Diego State University) and purely optional in others. Sometimes it’s an alternative—for example, if your GPA is lower than the minimum (e.g. 3.0), you may have to take the GRE in order to prove your academic worth. Work experience is a common requirement for executive degrees, but it can also factor into traditional programs. Read the admissions requirements carefully. Does it Hold NASPAA Accreditation? Oodles of online master’s programs in our rankings carry this accreditation (see our Accreditation section below for details). However, we should point out that there are plenty of strong degrees that haven’t chosen to go down the accreditation path. Consider it as one factor in your decision. Where Does it Appear in Rankings? U.S. News & World Report does not specifically rank online programs in public administration, but it does provide an annual list of the Best Public Affairs Schools in the country, as well as separate rankings for various specialties. Do You Need One? Just like the MBA or the MFA, the MPA is considered a terminal degree. That means you don’t usually need a doctorate in order to advance your career—MPA graduates are well-equipped to tackle day-to-day administrative and management challenges. If you’re interested in teaching at the university level or diving into complex research-related issues around public administration, then you may want to consider it. Can You Find One? They are rare, but they do exist. For example, California Baptist University is a regionally accredited school that offers a Doctor of Public Administration (DPA) in an online format. The coursework tackles areas such as leadership, strategic planning & management, performance management & evaluation, bureaucracy & accountability, etc. Most doctoral programs will want you to write an intensive, research-based thesis. Are You Thinking of an Online Undergraduate Certificate? These can be helpful if you’re not yet ready or don’t have the money for a bachelor’s degree. For instance, Eastern Kentucky University offers skills-focused, online undergraduate certificate options in emergency management, homeland security, fire and emergency services, and occupational safety. Make sure you can transfer certificate credits into a bachelor’s degree of your choice. Why Pursue an Online Graduate Certificate in Public Administration? Graduate certificates are ideal for professionals who aren’t quite ready for MPA. You could also consider an online certificate if you already hold a master’s degree and you want to add extra shine to your résumé. Do You Want to Focus on Management or Leadership? If so, you’re in luck. This is the most popular subject for online graduate certificates in public administration. For instance, IUPUI has online graduate certificates in Public Management, Public Budgeting & Financial Management, and Nonprofit Management; Golden Gate University has a certificate in Public Administration Leadership; and Old Dominion University has developed offerings in Public Administration and Policy, Public Sector Leadership, and Public Procurement & Contract Management. Lots of choice! What Other Kinds of Online Graduate Certificates Are Available? If you’re already working in a leadership position, you might want a program with more specificity. To take just one example, the University of Illinois – Springfield offers an Online Graduate Certificate in Emergency Preparedness and Homeland Security that caters to public administrators, law enforcement and fire department professionals, public healthcare providers, etc. You don’t have to settle for general topics. Will Your Online Certificate Credits Transfer to a Degree? It’s best to find out beforehand if your online credits will transfer smoothly to a master’s program (online or on-campus). This should be relatively easy if you’re interested in a graduate degree at the same university. For example, online graduate certificates in public & non-profit management from the University of Indiana Bloomington serve as a gateway to the Online MPA. Can You Enroll if You Live Out-Of-State? 99% of the time, the answer is going to be yes. Most schools have reciprocity agreements that allow students from other states to enroll in distance learning programs. However, you may find that your state is one of the rare exceptions to the rule! Reciprocity problems tend to pop up with programs that have clinical components (e.g. nursing, education, counseling etc. ), but it’s always best to check. You’ll find details on the State Authorization page of the university’s website. Does the Program Fit With Your Schedule? Online programs are typically very flexible—think multiple start dates, shorter terms (e.g. eight-week sessions), and asynchronous classes (i.e. there’s no need to log in at a certain hour). Having said that, online degrees in public administration will often have on-campus components or mandatory internships, especially at the graduate level. You will need to factor these into your calendar. What is the Credit Transfer Policy? If you want to transfer academic credits, or you hope to get credits for prior work experience and training, read the webpage on the university’s credit transfer policy. Some schools will go out of their way to assist you. For example, Indiana University’s Credit Transfer Service (CTS) helps prospective students see how their courses from another college or university will transfer to IU schools. Who is Teaching Your Online Course? Thankfully, schools usually provide a complete list of instructors for online public administration degrees (especially with MPAs). You’ll often find a section on the program website devoted to faculty profiles. But you don’t have to take the university’s word for it! Look up your professor’s qualifications on LinkedIn, search for online reviews of courses, and ask alumni about the degree experience. You deserve to study with experts who know how to teach. Is the Coursework & Training Relevant? Strong online public administration programs will prepare you for a career from day one. Look for practical degrees that include experiential components, case studies, and exposure to real-world scenarios. You can also ask about outcomes. Just like MBA degrees, online MPA programs will often post detailed information about graduation rates and job placement statistics. For instance, Central Michigan University has an entire page on admission stats, graduation & employment data, faculty profiles, and internship placements. How Does the Program Support Online Students? Distance learning is a climb and good schools will see that you don’t fall. At Florida International University, for example, online students are provided with a personal success coach who offers guidance and motivation throughout the program. In the University of North Carolina at Chapel Hill’s Online MPA, enrolled students have access to personalized career coaching appointments with a dedicated career consultant. Take a tour of the online classroom, examine the student services section, and settle for nothing but the best. Are There Hidden Costs? Read the section on tuition & fees thoroughly. Even if you don’t have to pay for campus facilities, universities and colleges often tack on fees for distance learning or technology. Considering an MPA or graduate program? You may need to factor in costs for campus residencies and travel to internship sites. Some schools will also expect you to pay for materials (e.g. textbooks) and computer software programs. Budget for everything. Is Financial Aid Available to Online Students? If you choose an online public administration degree program (undergraduate or graduate) from a regionally accredited institution, you will almost always be eligible for financial aid. However, we always recommend a virtual visit to the school’s Office of Financial Aid. In addition to advice on the FAFSA, the office will have info on external funding options (e.g. outside scholarships, employer reimbursement programs, etc.). Also remember that non-degree programs (i.e. certificates) are usually ineligible for financial aid. What Can the School Do for Military & Veterans? Online public administration programs may be ideal if you’re aiming for a career in the public sphere & government or transitioning into civilian life. So be sure to talk to the Office of Military & Veterans! Some schools offer specific scholarships to military and their families; others go out of their way with benefit packages. For example, IU Bloomington’s SPEA Connect waives application fees for military students and offers credit for service. It also has a Military Service Recognition Award that guarantees in-state tuition. If you have any concerns about a university offering an online program in public administration, check the state where the institution is located and then have a look at our Online State Rankings. Under each state, we have a detailed list of Online Schools with Accreditation & Quality Concerns. The following universities appear in our rankings of Top Affordable Schools for Public Administration and Top Online Schools for Public Administration. That means they have met some extremely tough criteria for quality, flexibility, price, and use of financial aid money (you’ll see a CAG Score next to their profiles). The Online BA in Public Sector Management and the Online MPA at CSU-Northridge fall under the auspices of the Tseng College of Graduate, International and Midcareer Education. Tuition & fees are listed on each program page; there is a university application fee and a graduate application fee. Tseng has its own Tseng College Financial Aid Office, with some advice on financial aid applications, military benefits, and student sponsorship. But CSU-Northridge’s Financial Aid & Scholarship Department will also be able to assist you, especially if you’re interested in funding options for the BA (a degree completion program). CMU’s College of Humanities and Social and Behavioral Sciences (CHSBS) and CMU’s Global Campus jointly administer the Online MPA. The CHSBS website provides a helpful checklist of resources for MPA students with links to graduate tuition rates and info on financing your degree. As of fall 2018, any U.S. resident will qualify for in-state tuition. Military members (active duty military, reservist, guard members, their spouses, and qualified dependents) receive major tuition discounts; federal employees receive a modest discount and a waiver on the application fee. The Barbara P. Greene Endowed Scholarship in Political Science is open to CMU students majoring in political science, with an interest in state and local government. The ​Edward H. Potthoff Scholarship in Local Government Administration is granted to graduate students in a public administration curriculum who demonstrate a career interest in local government. The Political Science & Public Administration Study Abroad Grant provides small funds to assist students with costs related to study abroad. There are also College of Graduate Studies Grants, Global Campus Scholarships, Study Abroad National and International Scholarships, and general CHSBS Scholarships up for grabs. Tuition & fees for IUPUI’s Online MPA in Public Affairs are listed on the program website. Indiana residents receive a hefty tuition discount on the per credit hour cost! Indiana University charges a $30 per credit hour distance education fee for online courses. IUPUI’s Office of Student Financial Services can assist with financial aid questions. Want to subsidize your education? IUPUI’s Office of Student Scholarships has a section on Graduate Scholarships & Grants; current graduate students should also take advantage of the IU GradGrants Center. If you’re thinking of attending a relevant conference during your studies, don’t forget to apply for the travel fellowship. ODU Online has a full rundown of the Online MPA, including the scoop on tuition rates (Virginia residents get a slight discount on the per credit hour cost). ODU is known as a military school, and active duty service members in Virginia may be eligible for in-state rates. The Office of Finance and the Office of Student Financial Aid can walk you through the financial aid process for graduate students. If you’re looking for scholarships, remember that the MPA is handled by ODU’s Strome College of Business. Strome has a a number of fellowships & scholarships that are open to graduate students. The Spore Scholars Endowed Scholarship and the Wolfgang Pindur Endowed Scholarship in Applied Research, in particular, will apply to graduate students enrolled in the MPA program. Costs for Rutgers’s Online MPA at the School of Public Affairs and Administration (SPAA) are detailed in SPAA’s section on tuition & fees. The Office of Student Accounting, Billing, and Cashiering also posts updated rates for 100% online programs. There is an online program fee per course. The university has a Rutgers University Tuition Payment Plan (RUTPP) so you can pay by the month. If you are out-of-work, you may also be eligible for the New Jersey Unemployed Workers Tuition Waiver Program. Interested in alternative sources of funding? The Office of Financial Aid has Information for Graduate and Professional Students; Rutgers’s GradFund program offers advice and support about external funding. Better yet, there a few SPAA graduate scholarships specifically for MPA students! In addition, SPAA subsidizes graduate student travel to conferences through the Graduate Student Conference Travel Fund. You’ll find all the details about SDSU’s Online MPA in the School of Public Affairs (SPA) and the College of Extended Studies (CES). Tuition rates are listed on the program website. MPA students must pay for their own course materials, as well as travel and accommodations for the two on-campus experiences. SDSU’s Division of Student Affairs has the rundown on financial aid & general scholarships. We also wanted to note that SPA has a number of public administration scholarships that are open to MPA students—check with the university to make sure the 16-month online program is eligible before you apply. For the latest on the TAMU’s Executive MPSA, visit the Bush School of Government & Public Service. Under the EMPSA program, you’ll find a lengthy section on financial aid & program cost. The bad news is TAMU does not post tuition rates on its website. Instead, it asks you to contact the Bush School Online Advising Center for the most recent estimate. Costs will vary according to residency and other factors. The good news is waivers & exemptions may be available. The best news? Students enrolled in the Online EMPSA are eligible for financial aid and veterans benefits are accepted. When it comes to scholarships, be sure to apply for the Bush School Outstanding Online Student Scholarship for EMPSA Students and the Bush School Online Student Scholarship for Non-Residents. If you live in Texas, you’ll have even more opportunities! These include the Bush School Online Student Scholarship for Texas Residents and the Texas Aggie Graduate Grant Opportunity. UCF Online clearly spells out the details for its Online MPA, as well as its dual degrees (Online MPA/MSCJ and Online MPA/MNM). Per credit hour costs are listed on the program website, but the Office of Student Account Services also lists the rates & fees for online graduate students. Florida residents pay much less than out-of-state students! Online students receive a waiver on most campus-based fees. For help with financial aid applications, visit the website of the Office of Student Financial Assistance. While you’re there, you may want to look through Scholarships A2O to see if you qualify for any general UCF scholarships. The College of Health and Public Affairs administers the MPA and dual degree programs, and you’ll find details there on Department of Criminal Justice scholarships. UCCP’s flexible MPA is offered online, on-campus, or in a blended format. Tuition & fees are listed on the program website. Colorado residents and out-of-state students who commit to a 100% online format pay much less than non-residents who combine campus & online classes. The Office of Financial Aid, Student Employment & Scholarships has an entire section devoted to aid for graduate students. Need extra funding?The School of Public Affairs also offers special scholarships to its graduate students, including the Arthur B. Murphy Scholarship, the General School of Public Affairs Scholarship, and the Karen Possehl Women’s Endowment (KPWE). Search through UCCS Scholarships for more opportunities. Another bonus? The MPA qualifies as a Western Regional Graduate Program (WRGP). That means residents of many Western states (e.g. Alaska, Arizona, California, Hawaii, etc.) may be eligible for in-state tuition. Military members and veterans looking for benefit info should check out the website of the Office of Veteran and Military Student Affairs. CU Denver’s School of Public Affairs is responsible for its Online/Hybrid MPA, but you’ll also find an excellent summary of the program on CU Online. This includes a breakdown of tuition & fees (see also graduate tuition & fees). Colorado residents get the best tuition discounts, but out-of-state students who choose a 100% online degree will also get a break on per credit hour costs. For help with financial aid, head over to CU Denver’s Financial Aid & Scholarships Office. There you’ll find a link to ScholarLYNX, CU Denver’s scholarship database. More specifically, the School of Public Affairs awards over $500,000 annually in scholarships and assistantships; many of these funds are available for graduate students (e.g. Diana Boulter Scholarship for a student who is employed full time and has family responsibilities). Just like UCCP’s program, CU Denver’s MPA is a Western Regional Graduate Program (WRGP). That means residents of many Western states (e.g. Alaska, Arizona, California, Hawaii, etc.) may be eligible for in-state tuition. Mizzou Online has a handy summary of UMC’s 100% Online Master of Public Affairs, including a section on tuition & financial aid; MU’s Office of Cashiers also has details on the latest tuition rates. Residents and non-residents pay the same graduate tuition rate. Online students must also pay course & IT fees on a per credit hour basis. The Student Financial Aid Office has useful advice for graduate students (75% of MU graduate students receive some sort of financial aid). Better yet, the Harry S. Truman School of Public Affairs has an entire section on funding the MPA. Unfortunately, students enrolled in the MPA mid-career online option are not eligible to receive the Capital Fellowship. But the Truman School does offer modest MPA Travel Awards for conferences. Finally, if you are a veteran, active duty service member, Reservist, National Guardsman, a military spouse or a dependent, be sure to check out the Mizzou Online Military Tuition Award! This gives distance learners a 10% reduction on tuition for credit hours. At MPA@UNC, you’ll discover all the details on UNC-Chapel Hill’s Online MPA, including admissions, tuition & financial aid, a breakdown on the cost of attendance, veterans benefits, and more. Tuition is charged on a per-credit-hour basis; residents and non-residents pay the same online tuition rate. There are additional administrative fees for each course. Tuition excludes fees, books, and other required materials. The MPA is administered by UNC’s School of Government, but all online applicants are automatically considered for UNC’s MPA fellowships, including the North Carolina Public Service Fellowship, North Carolina Public Leaders Fellowship, MPA@UNC Fellowship, and partner organizations fellowships (e.g. National League of Cities). Approximately 60% of students get some level of assistance through fellowships. Although UTA’s Online MPA is handled by the Department of Public Affairs in the College of Architecture, Planning and Public Affairs (CAPPA), your first stop should be UTA Online. Here you’ll find details on MPA tuition, as well as application fees and graduation fees. The per credit hour cost is the same for in-state and out-of-state residents. In addition, UTA Online provides specific financial aid advice to online students and offers help for military and their families. The Office of Financial Aid & Scholarships can also lend a hand with applications. There are a few CAPPA planning and public affairs scholarships that may be worth investigating. Check with UTA to make sure that students in the accelerated online program qualify for the terms. We can’t stress this enough (or shut up about it)—make sure that your university or college has regional accreditation. Regional accreditation is granted to an institution, not an individual department or degree, so it will cover both on-campus and online programs. The reason for our paranoia? Earning an online qualification from a regionally accredited university or college will help you qualify for federal financial aid, transfer academic credits; apply for student loans, scholarships, and tuition reimbursement; and gain acceptance into graduate programs. Many regionally accredited schools will not accept credits from nationally accredited schools. The Network of Schools of Public Policy, Affairs, and Administration (NASPAA) is a membership organization that accredits master’s degree programs in public administration (i.e. public policy, public administration, public & non-profit management, and public affairs) throughout the world. NASPAA does not accredit schools, undergraduate degrees, or PhD programs. Online public administration programs can be NASPAA-accredited. To find an online program, use NASPAA’s School Search. Hit “Show” and then find the section on “Is online coursework available?” You can decide whether you want a hybrid/blended program or one that is 100% online. View a roster of all NASPAA-accredited programs. We go into more detail about these organizations in our guide to Affordable MBA Programs. AACSB is typically regarded as the gold standard. Certified Public Manager (CPM) credential from the National Certified Public Manager Consortium (NCPMC). CPM professionals are eligible to become members of the American Academy of Certified Public Managers (AACPM). Certified Associate in Project Management (CAPM) and Project Management Professional (PMP) credentials from the Project Management Insitute (PMI). These are widely recognized project management qualifications that have applications in any number of fields. Education requirements for these certifications vary (e.g. CPM candidates must complete 300 hours of study through a special CPM program accredited by the NCPMC), so it’s best to check with the certification body if you have any questions about the relevance of your online degree & coursework. Some early-stage credentials (e.g. CAPM) may only require a high school diploma. Offered by the Association of Government Accountants (AGA), the Certified Government Financial Manager (CGFM) is a popular credential for government financial managers & budget analysts. The certification process covers governmental accounting, auditing, financial reporting, internal controls, and budgeting at the federal, state, and local levels. Before you can take any of the CGFM examinations, you must have a bachelor’s degree from an accredited college or university. However, that degree can be in any subject area and there is no stipulation that it has to be on-campus. As you might expect, many CGFM candidates have an undergraduate degree in accounting or a similar financial field.